Things I liked: A really well finished rifle. Excellent finish on the wood and nice bluing. Very few plastic parts. Outstanding accuracy after considerable break-in period-at least 500 rounds. Not too loud-after break-in! Front sight is well protected and makes cocking less painful. Very powerful rifle. Things I would have changed: The 4X scope is OK, but the rifle does so much better with better optics. What others should know: Give this rifle some time! It has some really good features, but some of them take some time and shooting to break in. Too many people get frustrated by some mediocre initial performance, say for the first 2-300 rounds. The trigger can only be adjusted so far, but it gets better with use. You get a real accurate sledgehammer if you can put in the time. You will end up with a real gem for the low investment. Keep oils out of the bore and compression chamber. Read and follow instructions and don't believe anything online. Can be pellet fussy. Call the guys at P.A.! Things I liked: I'm impressed with its new technology compared to the traditional coil spring. Powerful and cocking is not for weak arms. Good accuracy. Safety lever is one finger maneuver. Rigid wood stock. Front sight is covered. Things I would have changed: I still have my Beeman 250 when I purchased it in 1978. Recoil is the common issue with this breaker. The backstop on the rear dovetail is so weak that it needs double screw. Change the rear open sight with quality Weihrauch & Beeman HW micrometer. Metal trigger should be available soon. This air gun has a promising future. What others should know: This rifle is made in China. 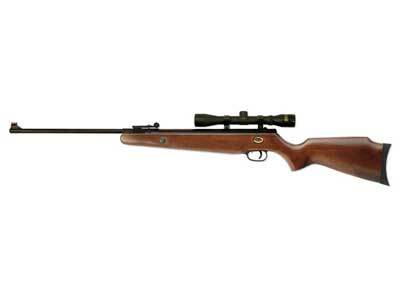 Don't expect excellent performance with regards to accuracy, design to expect with your wish list air rifle. The scope is a junk. It has got beveled dovetail (end to end rail are slit in design. Replace it with Hammers Magnum spring air gun scope 3-9X32AO with one piece mount - if you decide with this scope, the mount will not get into dovetail rail - instead install with an 11mm one piece mount with detachable one side tightening clip at least with 4 screws. I bought from PA a BKL 4inch mount and I can't insert it into the dovetail rail because of design flaw. I have not made any changes to my newly purchased air gun due to warranty except for mounting a new scope. This air gun will have its place to top other dominating breakers because of its price. I recommend it for everyone. Things I liked: Really nice and light. Very accurate do to the choked barrel. Recommend buy for someone who wants a good gun that is affordable!! Things I liked: Accuracy and price. Very close groupings straight out the box using the sight. Things I would have changed: Scope needs improvement. Odd I installed BKL mounts on mine that arrived today. Are you sure you know how ti use BKL mounts you must insert the screw in the spreader hole and tighten until it just slips into the dove tail put the screw back in the mount hole and tighten.